In the 1930s more and more people were discovering the joys of the Norfolk Broads. On the river, half a dozen Cruisers or Yare and Bure One Designs jockeying for position before a start could form a veritable barrage to river traffic. 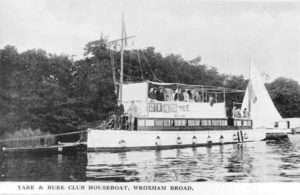 However, in 1937, word got round that there was a chance of obtaining a lease of Wroxham Broad so during Wroxham Regatta Week a meeting was held on the old houseboat, it was decided to explore the matter further and sound out the views of the local sailing clubs. The Yare and Bure Sailing Club, formed in 1907, decided unanimously in favour of amalgamation, and the Norfolk Dinghy Club supported the scheme. Support was also forthcoming from the Great Yarmouth Yacht Club. This club, founded in 1883, had raised subscriptions in 1897 for the prestigious Diamond Jubilee 150 Guineas Gold Challenge Cup, now raced for by Mixed One Designs sailed by NBYC members only at the end of Wroxham Week. The success of the new scheme was now assured and approved on October 27th, 1937. Work began on transforming the site at Wroxham Broad – land was drained and a cinder track constructed, trees were thinned out to make a car park, a jetty was constructed to give access to the club houseboat and a starter’s box erected on piling next to the jetty. 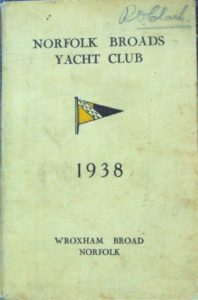 The social and business life of the club was carried out at first in the old club houseboat (formerly the property of the Yare and Bure Sailing Club) but by the end of the 1938 season, membership stood at nearly 600, and a tea pavilion was built with provision for a glass front when funds permitted. Racing was held three days a week all through the war. The course was made more challenging in that old wherries and houseboats were moored at intervals across the water to prevent enemy seaplanes landing. (Wroxham Broad, being privately owned, was exempt from a security ban on boating on the Broads). The clubhouse remained a social centre throughout the war and afternoon tea, complete with cucumber sandwiches, was elegantly served on tables covered with snowy white linen tablecloths on Sunday afternoons. During the first season the E.D.P reported that there were “more cruisers than ever, the 56th Yare and Bure One Design has been built, the Broads One Designs are moving up to number 31, the Norfolk Dinghies have sprung to 45 almost in a night and new classes like the International Star class and the National 12-foot dinghies are taking their place on the starting lines”. In the 1950s there was also an enthusiastic class of Enterprises and some Fireflies, later came the Mirror, Wayfarer, Laser and Yeoman classes. Many visiting competitors have testified that Wroxham Broad is a demanding place to sail, with its varying wind patterns and tight starts, and over the years it has reared many outstanding helmsmen and women who have thrived on the discipline and competition provided by the club and gone on to win national acclaim. That standards remain high owed much to the dedication and accuracy of our time-keepers and recorders, not to mention the Flag Officers and others who have contributed so much over more than half a century.